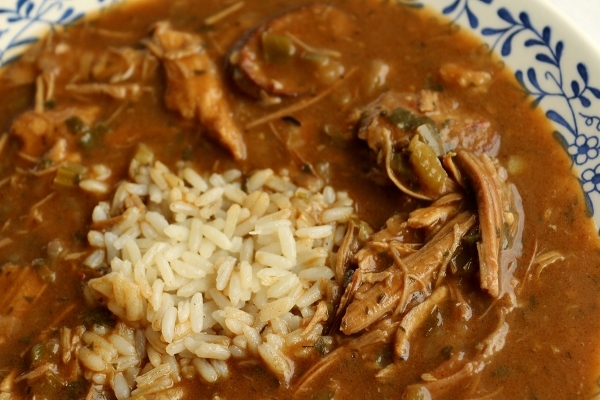 I had planned on making this turkey gumbo after Thanksgiving using some of the turkey leftovers, but alas I got the flu the week of Thanksgiving and it kind of threw all of my Thanksgiving cooking/baking plans for a loop. Luckily I was able to freeze a quart container filled with shredded turkey meat (topped off with some turkey jus to keep it from drying out), and it was as good as new once I thawed it out last weekend. 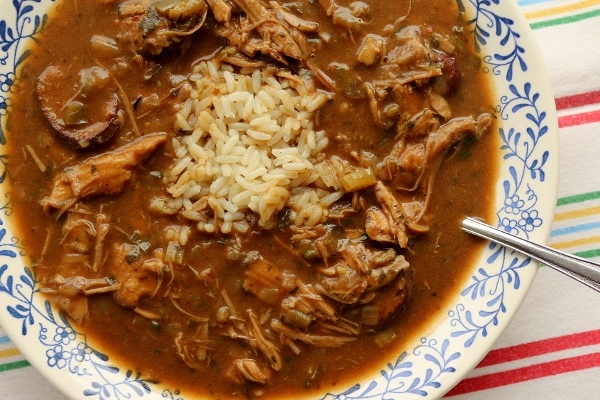 Game on, gumbo! 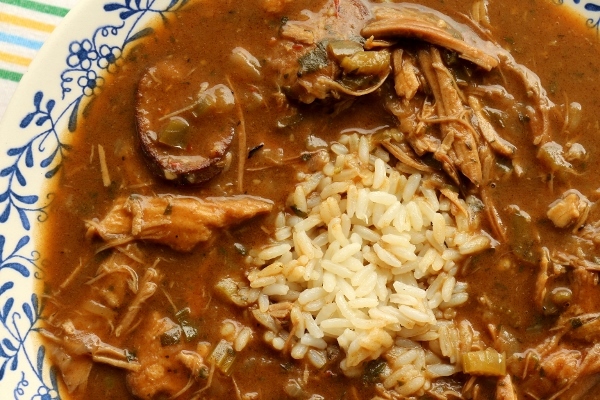 Gumbo isn't necessarily difficult to make, but it can be time consuming. This gumbo takes about 1 1/2 hours to cook, not including prep time. It's absolutely worth the effort in my opinion, and is the essence of winter comfort. With some smokiness from the sausage, spice from the cayenne, all served piping hot over a bed of rice, you really can't go wrong. My andouille sausage was purchased at Whole Foods, and was pretty smoky. I might try a different brand in the future, or add the sausage a little later in the process just to hold back a bit of the smoke. If you're planning a Christmas turkey (why should Thanksgiving have all the fun?) 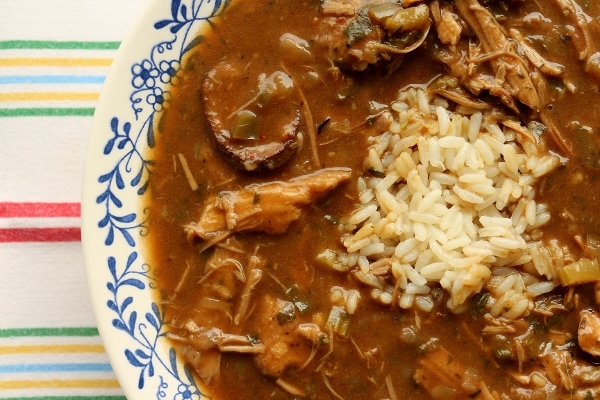 and looking for a creative way to use some of your leftovers, this gumbo is a great option! You can even use the carcass to make turkey stock for the gumbo, although store-bought turkey or chicken stock works fine. And if it's not turkey season this recipe works just as well with shredded chicken meat. Heat the oil over medium heat in a large Dutch oven. Add the flour and combine until smooth with a wooden spoon, stirring slowly and constantly for 15 to 20 minutes, make a dark brown (chocolate colored) roux (lower the heat if it's darkening too fast). Add the onions, bell peppers, celery, garlic, salt and cayenne to the roux and stir until soft, about 5 to 10 minutes. Add the sausage and thyme, and cook, stirring often, for 5 minutes. Add the broth and bay leaves and bring to a boil. Reduce the heat to medium-low and simmer, uncovered, for 45 minutes. Add the reserved turkey meat, and cook for 15 minutes. Remove from heat, let sit for 5 minutes. Taste, adjust the seasoning if necessary, remove the bay leaves, and add the parsley and green onions. Serve in soup bowls with hot rice. 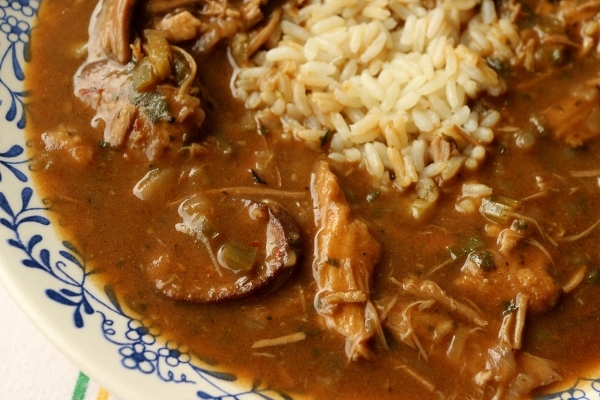 DO AHEAD: The gumbo can be prepared ahead and kept, covered in the refrigerator, up to 3 days, or frozen, in an airtight container, up to 3 months. To reheat: Warm the gumbo in a heavy pot over moderate heat, adding additional chicken stock as needed to adjust the consistency.